An activity centre located near Dunlewey, County Donegal. Ionad Cois Locha is situated on the shores of Dunlewey Lough in the shadow of the haunting and mysterious Poison Glen. Enjoy an AV show, introducing the town land of Dunlewey,followed by a demonstration of weaving and spinning. Our experienced guides will then take you on a trip back in time through the cottage of Manus Ferry (The World Famous Weaver). The cottage is a gateway to the past and is to this day preserved just as it was when Manus Ferry weaved his famous tweed. Take the boat trip on the Grainne Rose out on Dunlewey Lake,where you can absorb the scenery, passing spectacular landmarks such as a prehistoric Crannog, whilst listening to mystical and enchanting stories that surround Dunlewey such as 'The Green Lady'.Our Restaurant and Tea rooms are ideally situated to give dramatic views of the surrounding landscape. 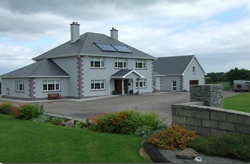 Located close to Dunlewey village. Sorry there is currently no listings for Dunlewey.